Given your background in computer science, a field which is more structured, how did you transition into the arts, where there are less rules? In the society that we live in, parents have a lot of expectations from their children, especially when it comes to pursuing a college degree. When I was growing up, I knew I had to venture into science, to fulfil my parents’ wishes, I chose to pursue a degree in IT and flew to New York. While I was studying such a structured subject, I was always keen to offer my services to society by any means possible, whether it was through technology, medicine or education, I was always rigid about my aspirations. As a child, I was always inclined towards arts and literature too, I knew it was something I wanted to get into. When I had my second inning in Kathmandu, I kept thinking to myself, how can my technological degree be of use here? I definitely didn’t aspire to get involved in a nine to five job and thought I would revive Kolpa Traders again. So, from 2011 to 2014, I started doing extensive research. I started meeting a lot of artisans from the cottage industry and attended every expo possible. These interactions showed me that these artisans had been doing tremendous work but they hadn’t been able to change their quality and standard of life. I knew where I had to tap in. I wanted to sell these products abroad and started Kolpa’s journey again. I opened a website and started shipping the products everywhere possible. I have always wanted to help these artists be appreciated. It was tough in the beginning, but now it’s good. How has Kolpa helped bring social impact? Kolpa is a brand that markets ethical products and works towards a fair share policy. Over here, we have two different streams: production and promotion. 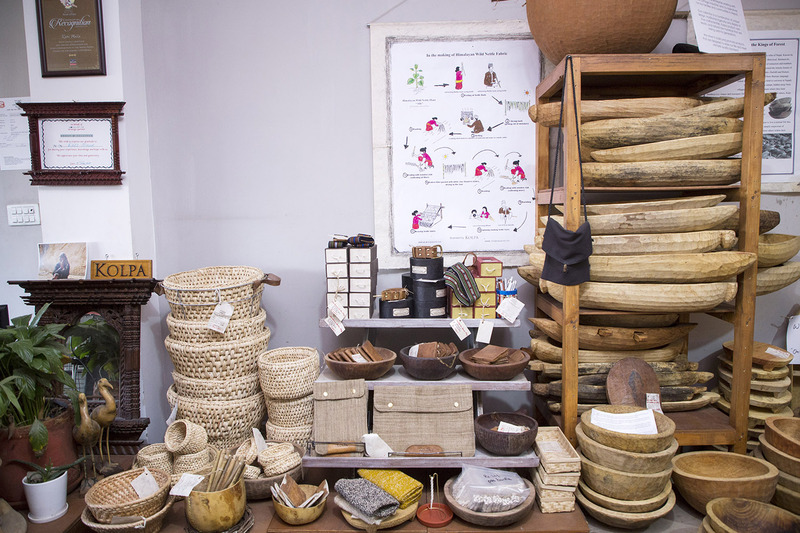 We promote artisans’ handmade products that have not been marketed well. In the production arena, there are so many people with refined skills in our country but it’s a bitter fact that they have been undermined and undervalued. We bring these people to the same table and blend these skills, coming up with a functional design. We want to design products that are contemporary and fit in all parts of the world. A few years ago, these artisans were finding it difficult to sell their products and were demotivated. Now they don’t have to struggle as much anymore. Demand has soared. The whole community is now working towards uplifting its economic state. I feel happy that our brand has helped create better opportunities for people in rural areas. We have maybe around 100 artisans collaborating with us now. Where are the artisans all based and what kind of materials are used in Kolpa’s products? as most of the raw materials are only available seasonally. Every community has a different touch. Our artisans use wild nettle, ningalo including patter, which is used to make sukuls in Nawalparasi, and Nepal leather in Sindhupalchowk. We are working with hemp too, which is found in Rolpa. We started with cotton but raw materials were being imported from India, so I knew that wouldn’t work. We are very particular with the kind of materials we use. We want everything to be from our soil. It’s always good to be exclusive. As Kolpa Nepal is a commercial business, do the artisans undergo any training, especially when it comes to refining their products? Our country has a very difficult geography and most artisans haven’t been exposed to the outside world. All these products are their original creations. I don’t believe in providing them with any external training. No European or Japanese machines are used to refine these products. These are solely the creations of the artisans. Over the years, the products have been well appreciated all over the world and this applause has been showered because of their skill sets. I believe that to come up with refined products, patience and commitment is all that is needed. Most of them aren’t even educated but they are masters in their own rights. We wouldn’t like to call their work “products” because it’s an art that has been passed down through generations. How does profit sharing work between you and the artisans? I work with different communities and profit-sharing differs from one to another. We give the same amount of fair share to the artisans as to those living in the city. This way, we want to encourage the artisans to not migrate to Gulf countries or even to the Capital; they can earn the same amount living in their homes. We don’t want our artisans to feel cheated and we keep everything transparent. We also work with the Raute community, who prefer working under a barter system. We plan to come out with an outlet in Japan because they appreciate works made with natural products. We are looking to explore such opportunities. Also, our artisans come from rural areas where mobile connections are not available. We want to reach out to them in every way possible. In the future, we plan to give orders to artisans themselves where they can customise products according to customers’ demands via tablets or phones. This could change the way we work and make it more convenient for all three of us—artisans, customers and Kolpa.